AES motomation is committed to bringing value to our customers. We are sure that we can only do this by concentrating on a few, but well established and maintained partnerships. We are very pleased to work as representative of Sankyo Robotics and SINFONIA TECHNOLOGY. Sankyo Robotics designs, manufactures and markets industrial robots worldwide. Sankyo has a rich product portfolio of solutions and is also willing to customize solutions for individual requirements. Sankyo provides solutions to the semiconductor, the LCD/FPD and the solar industries. In 1998 Sankyo appointed AES motomation as European Robotics Representative. We were very pleased to receive this assignment after working with Sankyo Robotics Products for more than 10 years. Since 2002 AES motomation has represented Sankyo in North America as well. Today, with Sankyo operating its own robotics office in CA, AES motomation provides applications services in very close cooperation with and on behalf of Sankyo. 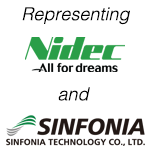 SINFONIA, founded in 1917, was formerly known as Shinko Electric Co., Ltd. and changed its name to SINFONIA TECHNOLOGY CO., on April 1, 2009. SINFONIA engages in the manufacture and sale of electric machinery and supports highly efficient manufacturing processes by drawing on the experience gained by handling products inside clean rooms. In particular, the Semiconductor 300mm wafer manufacturing modules have earned a high reputation among top brands, and SINFONIA was the world's first manufacturer to develop a 450mm FOUP capable load port. In September 2009 SINFONIA assigned AES motomation as their European and in July 2010 as their US Front End Products Representative. We were very pleased to receive these assignments after working on this cooperation since 2008.